This site is protected under copyright. Posts may contain affiliate links, which means I may receive a commission if you purchase through links in this post. Read more. So… salmon. It’s one of the few types of fish I’ll eat, and only because I know how healthy it is. I usually enjoy chicken, beef, or pork over any type of fish, but oven cooked salmon that can be ready in 10 minutes really can’t be beat. And I really do feel good after a meal of salmon. It’s not too heavy, is packed full of good omega fats, and is a good source of protein. Plus, the rest of my family adores it, so I’ve got a mom win under my belt anytime I make it. Really, there’s a whole host of reasons to get this lemon thyme salmon recipe on the table stat. 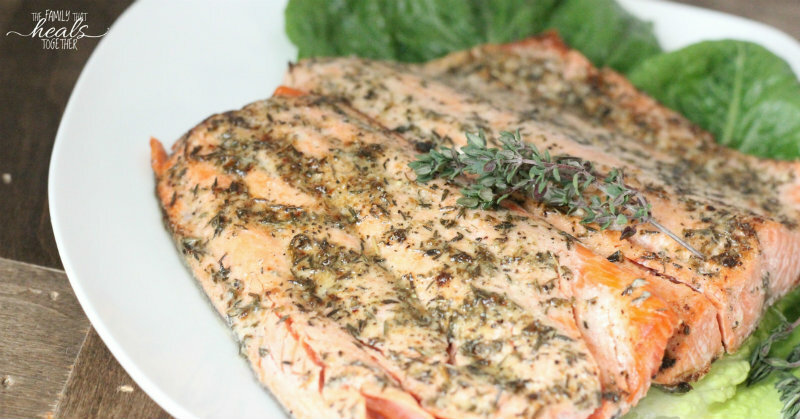 While I love a good grilled salmon, oven cooked salmon can be on the table in less than 10 minutes. It’s seriously fast and easy when you pop it under the broiler! It’s seriously high in vitamin B12, along with other B vitamins (aka the energy vitamins!). It’s chock full of vitamin D and selenium. It’s a good source of iodine (good for thyroid health and hormone support!). It’s a great source of protein (one serving is more than half what you need in a day). It’s the good kind of fat- not P.H.A.T but OH-MEG-AH-3s (in other words, good for your brain and heart!). What is the best type of salmon to eat? Because our oceans are an ever-increasing source of toxicity (including heavy metals), I don’t feel great about eating a ton of fish, but I do think the health benefits of salmon are worth eating it weekly or at least a few times a month. If you’re going to buy salmon, make sure that it’s wild-caught, as farmed salmon is likely to be fed nasty GMOs and even artificial junk to brighten the color of their flesh. Let’s not forget that frankenfish, aka genetically modified salmon, has been trying to break into our food supply over the last couple years, being approved, then banned, then who knows…? We also have “responsibly farmed” salmon available, but I choose not to buy it, for the same reasons I don’t like to buy “all natural” chicken, beef, or pork. Any kind of farmed animal is not in its natural habitat, and therefore, will not contain the nutrients an animal in the wild would. 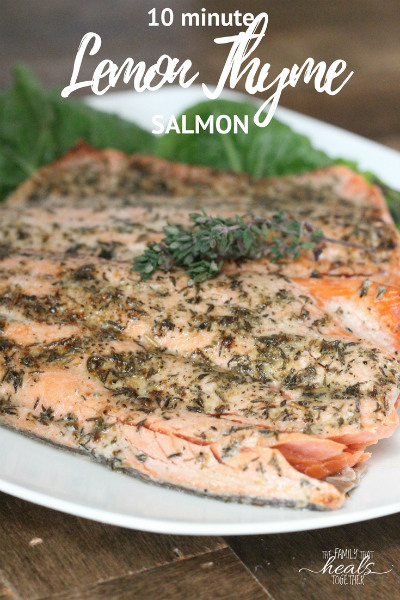 How do you cook salmon fillets? You can grill them over an open fire on wood planks, which I adore, but if you want something fast, I find a quick broiled salmon to be just as delicious, and requires a lot less work. Check out the recipe below to see how to cook salmon fillets in the oven for a fast and healthful supper. Preheat oven on high broiler setting. In a small bowl, combine mayonnaise, avocado oil, lemon juice, thyme, garlic powder, salt, and pepper and stir. Place salmon skin-side down in a casserole dish. Spread lemon thyme sauce over the top of the salmon, coating the top side evenly. Place on the top rack under the broiler and cook for 5-7 minutes, until salmon flakes away from the skin. Want more fast, easy, healthy (paleo! ), AND budget-friendly meals? I’ve got a major treat for you! A new paleo community e-book is finally here! 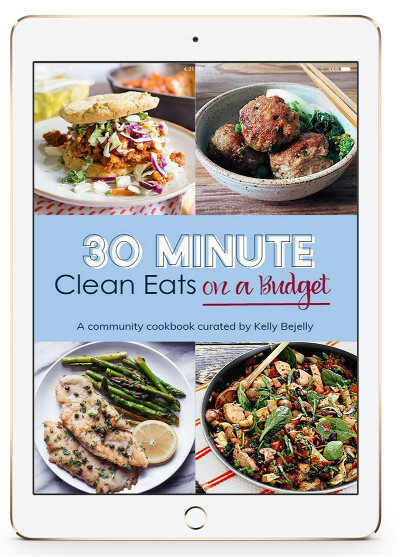 It features recipes from top paleo bloggers, with beautiful photos, delicious recipes, and simple suggestions. Curated by Kelly Bejelly of A Girl Worth Saving, you can bet it’s going to be an awesome resource if you need fast and healthy meal ideas on a budget. Grab 30 Minute Clean Eats on a Budget here. Want to save this recipe for later? Pin or share to social media using one of our links! When Jaclyn became a mom more than eight years ago, health food was the last thing on her mind, but when her son began to struggle with behavioral disorders, she dove in headfirst to begin learning about how to live and eat naturally. When she began to focus on paleo and GAPS diet foods, her son’s behavior began to improve, her children were healed of eczema and digestive problems, and her own thyroid disorder was healed. She blogs about raising her four boys to be happy and healthy at The Family That Heals Together. Collagen Powder Side Effects: No Risk, All Benefit? 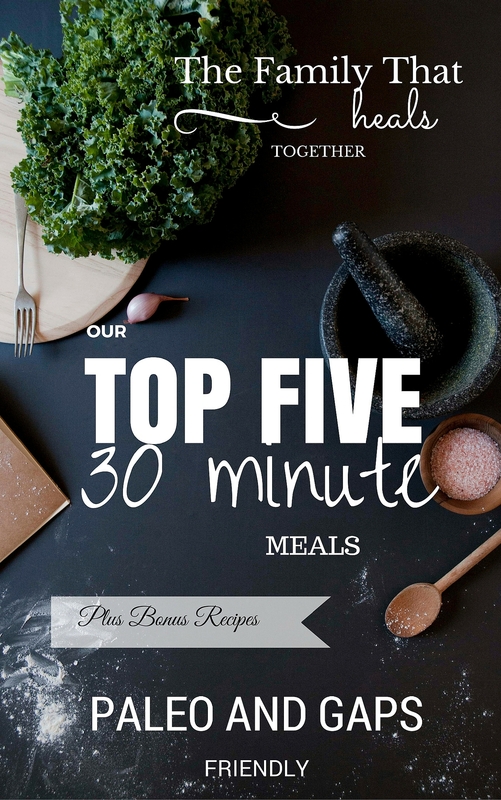 Get healthy meals on the table fast!